The Islamic State group claimed responsibility for Friday’s explosion. POLICE HAVE STEPPED up their investigation into the bombing of a packed London Underground train during rush hour after officers made a second arrest in their probe. The bomb went off on Friday morning in a crowded carriage and although the device is thought to have malfunctioned, it still wounded 30 people. 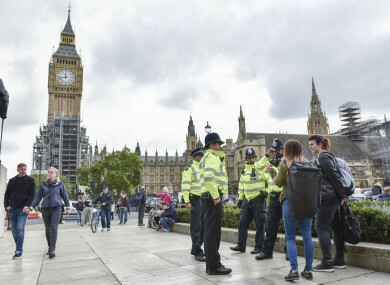 Britain downgraded the nation’s terrorism threat from its highest level following the arrest yesterday. It was the country’s fifth terror attack in six months, a series that has claimed 35 lives. Police said earlier yesterday that a 21-year-old man was detained late on Saturday in Hounslow, on the western rim of the capital. “The Joint Terrorist Analysis Centre, which reviews the threat level that the UK is under, have decided to lower that level from critical to severe,” interior minister Amber Rudd said in a televised statement. A critical threat level means another attack is “expected imminently” while a severe threat indicates an assault is highly likely. A search was underway in Stanwell, a few miles west of Hounslow, in connection with the 21-year-old’s arrest, police said. After taking into custody an 18-year-old man earlier on Saturday over the “bucket bomb” attack at the Parsons Green Underground station, police said they they were hunting for more suspects. Rudd said the police were trying to find out how the first man arrested was “radicalised”. The first arrest on Saturday took place at the Dover ferry terminal, a main link to Europe. A “number of items” were recovered during the operation and the man is now in custody in London, officers said. Police also raided a home in Sunbury, a town west of London on Saturday. Local residents quoted in British media said the owners of the house were elderly foster parents. CCTV footage obtained by British media yesterday appeared to show a man walking from the property on Friday morning, carrying a bag similar to the one containing the failed device. Now that the terror threat has been downgraded, soldiers deployed to guard key sites across the country “will return to their original positions” during the next few days, Rudd said. Email “Britain downgrades terror threat from 'imminent' to 'highly likely'”. Feedback on “Britain downgrades terror threat from 'imminent' to 'highly likely'”.